Half term followed by illness of coughs and colds for both little ones has totally wiped me out. I've barely left the house (going slightly insane), as once again I find myself lounging on the sofa, cuddling a sick boy and nursing a stuffy baby. So... how best to cure these winter blues/bugs you ask? They are just deliciously scrummy, crumbly, buttery and chocolatey. In the bowl of an electric mixer with the paddle attachment, cream together the butter and 1 cup of sugar until they are just combined. In a medium bowl, sift together, with a whisk, flour and salt; then add them to the butter-and-sugar mixture. Add the chocolate chips or cut up chocolate until just mixed in. Roll into a log about 10cm in diameter. Cut the log into two. Cover in wax paper or parchment. Carefully slice the log into 1 and 1/2cm cookies (like large coins). 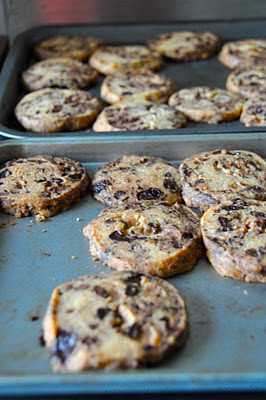 Place the cookies on a non stick baking tray. Bake for 11-13 minutes, until the edges begin to brown. Top Tip: The edges of the shortbread are ever so slightly sharper if you chill the cookies before baking them. In a nutshell, it's short bread with added chocolate chips. My 14 year old brother devoured them in his recent visit, stating quite categorically, that they were the BEST chocolate chip cookies he'd ever eaten. Now, if a teenager says that, then, it MUST be true.